GNMS-500D is an economic desanding plant for bore piling, TBM and micro tunneling activities. Piling and micro tunneling Desanding plants are used to remove solid particles in drilling muds, and purify the drilling mud, and make it is qualified for reusing in foundation engineering and construction engineering works. The piling and micro tunneling desanding plants can be used to treat either water-bentonite, water-polymere, or water-cement and bentonite suspensions. Desanding plants have further applications in gravel pits, in the mining industry, in water well drilling, in piling, in micro tunneling projects, and other underground activities. The treating capacity of a desanding plant is determined by the separated equipment treating capacity included in the system. GNMS-500D desanding plant is with the treating capacity up to 500GPM (120M3/H). The cut point of the system is 40 microns. It means the desanding plant can remove most particles above 40 microns. The mud cleaner GNZY753E-Y1S is a combination of shale shaker and desander cyclone assembly. The shale shaker is a D100 separation machine (separation efficiency is 100%), the shaker utilizes coarse solids via using different wiremesh screens. The up screen area is 0.875m2, the bottom screen area is 1.35m2, total screen area is 2.225m2. The desander cone size is 10 inch, with a 10 inch desander cone for 500GPM capacity. Desander feeding pump is centrifugal pump GNSB6×5A (37Kw). The system is complete with lighting system and electrical control system. Total power of the system is 39kw. Total weight of the system is only 2850. And the operation footprint is only L3506xW2050×H3721. It is very compact and easy for movement. 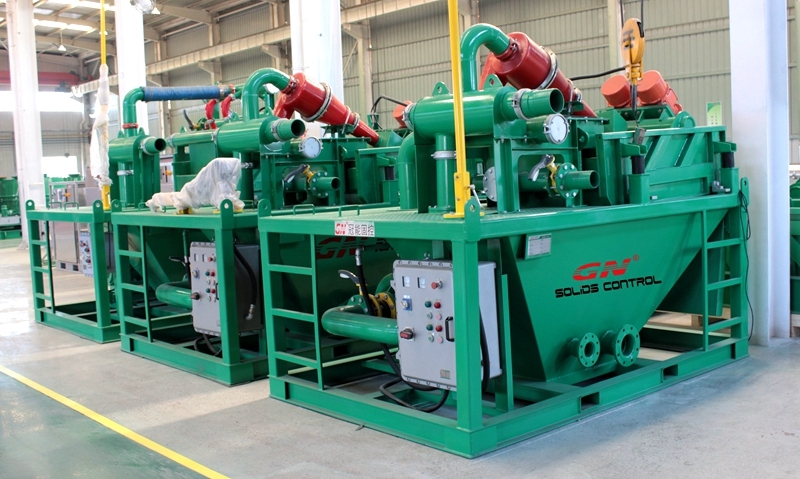 GN offers turnkey solution for different mud cleaning and recycling system. Desides GNMS-500D mud desanding plant, GN has GNMS-1000D for 1000GPM capacity and GNMS-200D for 200GPM capacity. GN does offer customized solution for different kinds of drilling mud treating capacities. If you have any questions about mud recycling and waste management, welcome you contact GN 24*7 service line.